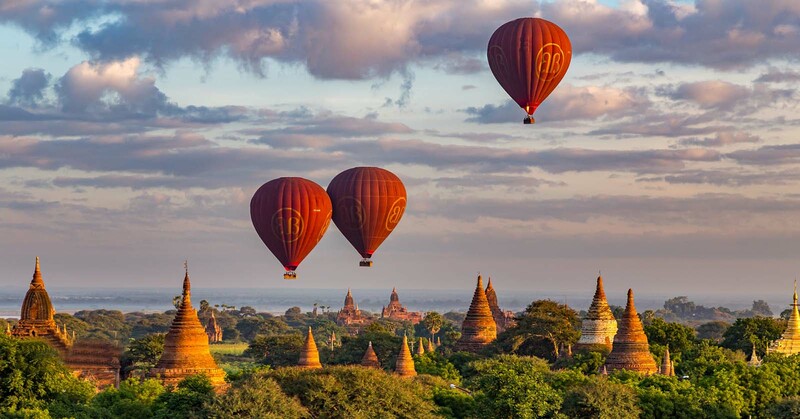 See the Best of Myanmar with a 6-day tour that’ll take you from Yangon to Bagan, Mandalay, Heho! Explore the famous sights of each area, seeing the most famous Sule Pagoda Pagoda and so much more. Arrival in Yangon. Transferred to hotel. Explore every corner of Sule Pagoda. Evening great sunset at marvellous Shwedagon pagoda. Flight from Yangon to Bagan. Sightseeing to the one of Asia’s most popular archeological destination. Visit colorful Naung U Market and visit some of Bagan most famous pagodas, visit Dhammayangyi Patho and much more. Early breakfast at hotel. Transfer to the Nayung U jetty. Take a cruise from Bagan to Mandalay. enjoy and observe the way of local life along the Ayeyarwaddy River. Arrival Mandalay jetty at 17.30. Transfer to hotel. Morning, transfer to Mandalay airport for flight to Heho. Upon arrival in Heho, transfer straight to Pindaya. Visit limestone caves overlooking the Pindaya Lake and Shwe U Min Paya. Late afternoon, drive to Nyaung Shwe jetty and take a boat trip to hotel. After breakfast, sightseeing on magical Inle Lake. See the fisherman rowing in the one-legged style characteristic of Inle Lake boatmen. After that, visit the Nga Hpe Kyaung (Jumping Cat Monastery), Phaungdaw Oo Pagoda. The boat trip takes you to Inn Paw Khon village where people make silk weaving, Nam Pan Village with cheroot and other cottage industries. Enjoy breakfast at hotel. Your leisure time in Heho. Take a boat trip to jetty. Upon arrival in Yangon International Airport by morning flight, we will welcome the you at the airport and transfer to the hotel. 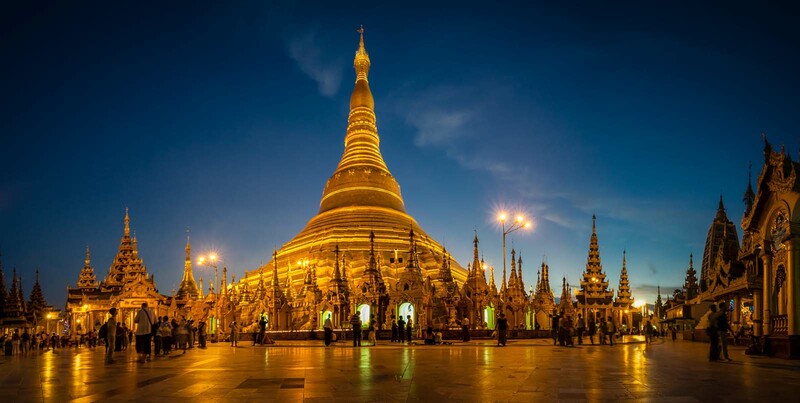 After hotel check-in and refreshment, start orientation tour in Yangon including Sule Pagoda (Land Mark in city centre), Legend said that it is 2,000 years old and the central stupa is said to enshrine a hair of the Buddha. Every corner around Sule Pagoda on a walking tour, you will discover a unique charm of Yangon with its old colonial architectature buildings such as City Hall, High Court, etc. Evening great sunset at marvellous Shwedagon pagoda & its pagoda bazaar. The massive and magnificent gold-encrusted Shwedagon Pagoda (100 meter high), is one of the wonders of the world. It was built 2500 years ago and enshrined with hair relics of the Buddha and a place to meet devoted Buddhists at meditation and pray. Overnight at hotel in Yangon. Breakfast at the hotel. Early in the morning transfer to airport for flight to Bagan which was the capital of first Burmese Empire. It covers more than 49 square kilometers containing over 2000 pagodas and one of the richest archaeological sites in Asia. Sightseeing starts with Bagan Archaeological Museum and Shwezigon Pagoda – built by King Anawrahta, a prototype of later Myanmar stupas, Htilominlo Temple well-known for its old mural, fine plaster carving and glazed sandstone decoration. In the afternoon, continue to discover Old Bagan where most beautiful testimonies of the splendors and the richness of this site conceal. Anada Temple – one of the finest in architecture and most revered temples with its four standing Bagan style Buddha images and huge carved teak doors, Ananda Oakkyaung – simply a Monastery built with red bricks, located within the precincts of the Ananda Temple. It was built in 1137 AD and paintings of the 18th century are seen in the walls of the monastery, Thatbyinnyu Temple – 201ft tall, the tallest in Bagan and it is shaped like a cross, but is not symmetrical. The temple has two primaries storey, with the seated Buddha image located on the second storey. Dhammayangyi Temple – the widest temple in Bagan, and is built in a plan similar to that of Anada Temple. In the evening, a horse-cart ride will take you among magnificent Temples about 2 hrs. Then, enjoy the memorable sunset over the world famous Archaeological complex from the upper terrace of one of the Bagan Temple. Overnight at hotel in Bagan. Breakfast at the hotel. In the morning transfer to the airport for flight to Mandalay, which was founded in 1857-1860 as the capital by King Mindon and remained the capital city of the Konboung, Myanmar’s last dynasty. Tour of Mandalay will take you to its significant sites includes Mahamuni Buddha Image – the most revered Buddha image in Mandalay and 4 meters high seated image is cast in bronze. Transfer to 18th century Amarapura, situated about 11 km south of Mandalay and about 15 minutes drives. Visit to Maha Gandayon Kyaung, one of Amarapura’s treasures, is a famous Buddhist monastery where more than thousand monks live and study. The morning meals procession of thousand of monks is very interesting. Amarapura is also known as a weaving city where silk dresses are woven and silk and cotton weaving workshops can be seen. You can walk the famous 200 years old U Bein Bridge – the world’s longest wooden Bridge across the Thaungthaman lake and 1208 meters long. After lunch time, you will be exploring more about Mandalay. Craftsmen’s quarters to observe brasses molding works, stone and marble carvers, gold leaf pressing, tapestry workshop, cotton and silk textile weaving, silver smith workshop. Shwenandawkyaung or Golden Palace Monastery – a very magnificent building beautifully carved in wood, dating back to 19th century. It is of great interest, not only as a fine example of a traditional Burmese wooden monastery, but also as a fragile reminder of the old Mandalay Palace. And then visit to Kuthodaw Paya – the world’s largest book of 729 marble slabs inscribed the entire Tripitaka. Overnight at hotel in Mandalay. Breakfast at the hotel. Transfer to airport for flight to Heho. Arrive in Heho and drive to Nyaung Shwe village, the starting point of the trip into the Inle Lake, passing through breath-taking scenery in many ways, with great panoramic picturesque landscaping, Pa-O and Danu women in colorful traditional dresses and their ethnic villages. It is also famous for Shwe Yan Pyay Monastery which is elegant ancient monastery with its oval-shaped windows. Arrive at Nyaung Shwe, a traditional long boat (motorized) will take you to Inle Lake, the vast, beautiful and picturesque nature lake, 900 meters above sea-level, 22 km long and 10 km across, is one of the main tourist attractions in Myanmar. And then sightseeing includes Phaung Daw U Pagoda – famous for 800 years old Five Buddha statues which are enshrined in the center of the building, Nga phe kyaung monastery – famous for its “Jumping Cats” and In Paw Khone village – well-known for silk weaving workshops and the technique and creation of the fascinating design of the silk products. Transfer to hotel by private boat and check in. After breakfast, the tour sightseeing for magical Inle Lake, which is located 1328 meters above sea level and 22 km long and 11 km wide. A traditional long boat (motorized) will take you to Inle Lake, the vast, beautiful and picturesque nature lake, 900 meters above sea-level, 22 km long and 10 km across, is one of the main tourist attractions in Myanmar. It offers an unforgettable pastiche of unique experience and is famous for its scenic beauty, the unique one-leg rowers, floating gardens, attractive villages, colorful markets and prolific birdlife. A boat trip on the lake is very enjoyable and exhilarating with a cool breeze, warm sun and seagulls flying overhead. After lunch, visit the Nga Hpe Kyaung (Jumping Cat Monastery) and have a sightseeing at Phaungdaw Oo Pagoda which is famous for 800 years old Five Buddha statues which are enshrined in the center of the building. The boat trip takes you to Inn Paw Khon village, well-known for silk weaving workshops and the technique and creation of the fascinating design of the silk products. Proceed to Nam Pan Village with cheroot. Breakfast at the hotel. After breakfast, free time for relaxation. You can be relaxing at the hotel to enjoy the pool, sun, and gardens or to enjoy at your leisure activities of your choice (no services provided). In the afternoon, transfer to airport for flight to Yangon and await for your departure flight. Tour price: USD per person.